My Relationship With The Lemon Cookie In The Kitchen. It all began when I walked in to the kitchen to get some salad for lunch. There they were, the cookies. Now normally I do pretty well in the face of temptation. 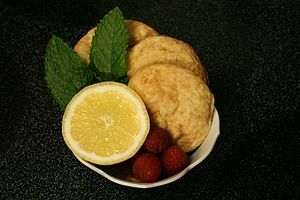 I can resist a brownie, some candy, a pastry, but lemon cookies? Eek. The only thing worse would be a lemon bar. I love the crisp, cool flavor of a citrus dessert. So there it was…beckoning salaciously…tempting me with its carnal scent. I retreated back to my desk, waiting until others were around, knowing I’d be less likely to dive into dietary turpitude in front of others, relying on peer pressure to help me resist. Then I loaded up on salad and went back to work. And yet periodically a sense of prurience permeated through the office. Was it just me? I found myself waiting, hoping someone else would grab it. Devour it. Save me from myself. PLEASE. All afternoon, this back and forth flirtation until… at 4 PM we did it. We hooked up. Nooooooooooo!!!!!!!!!!!! So remember this friends…when you are tempted by an irresistible treat and you enter into a relationship with a piece of food that tempts you to your core, it IS okay to indulge as long as you pay back your calorie debt. Just don’t make this sort of treat a daily occurrence and you’ll survive the occasional tryst.